While the rest of the country has been enjoying warm temperatures and sunshine, spring in the Pacific Northwest has been a rough one. With all of the rain, overcast skies, high winds and below 60 degree temperatures, it can be hard to believe that we’ll ever experience nice weather again. But there is hope! And it’s in the color of crimson. 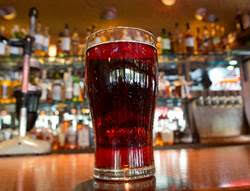 The return of McMenamins Black Cherry Cider is the prefect reminder that summer is almost here. This McMenamins seasonal uses a tradition dry apple cider base and adds a generous amount of sweet black cherry juice from local growers. The result is a seamlessly blended sweet and tart concoction that is a perfect pairing for late spring days. Available now through July at all of McMenamins pubs and properties. Coming up in May, McMenamins will celebrate their 25th anniversary of producing cider! To mark this DIY milestone, fans are invited to a one-day celebration at Edgefield on Friday, May 19 to taste cider fondue and enjoy discounted prices on cider pints and growlers fills. It’s a cherry on top of Black Cherry Cider!